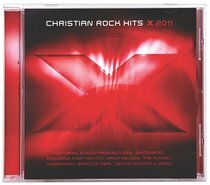 X 2011 delivers the most popular Christian Rock hits of 2010-2011 from artists like Hawk Nelson, FM Static, Kutless, The Letter Black, Manafest, Ryan Stevenson, Sent By Ravens, and more. With more than 475,000 albums sold, "X" compilations are essential listening for Christian rock fans. About "X 2011 (X Worship Series)"